Have you ever had nightmares about running through the streets of New York, avoiding sharks and running over busses along the way? Well either way, in Sharknado it’s exactly what you do. Oh, you also surf and stand on sharks battling a tornado. 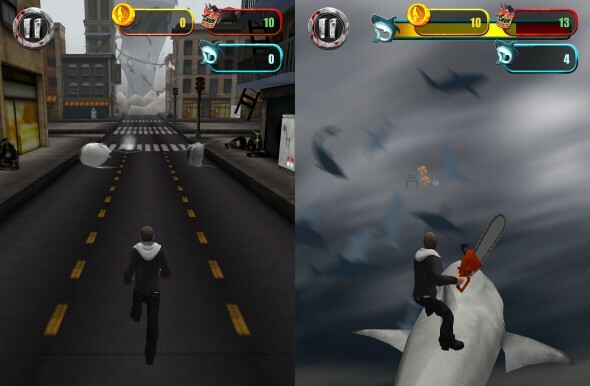 Sharknado: The game is based on SyFy’s Sharknado 2: The Second One. Story-wise, the game doesn’t offer much. It only ties in to the movie in terms of setting and uses its main-character Fin. Otherwise don’t expect anything in the form of cinematic trailers or background story. Throughout the different phases of the game, the background music changes. It’ll basically swap between an instrumental rock track, the movie’s soundtrack and the roaring of a tornado combined with the noise of a chainsaw. For a game like this, it works quite well. Hearing those over and over again will get annoying though when playing for longer periods of time. 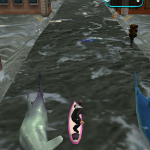 Sharknado: The Game is rough around the edges, very rough. While that shows on all aspects of the game, it stands out in the graphical department. The environments look dull, lack color and could use some more detail. Also different sorts sharks could’ve had some more variation between them, I found it hard to notice the difference between certain types. They do all have some unique looks to them, but when the game’s speed gets ramped up, you often have to choice which shark to go for and then it would’ve been nice to be able to distinguish one from the other faster. 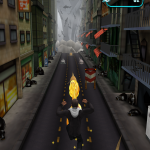 The endless runner genre is one of the oldest ones out there. Lots of recent games still managed to really stand out within the genre though, think about the Temple Run game which had a lot of success. Sharknado has a fresh enough setting to not feel like a clone. You can slide, jump, move left and move right while avoiding obstacles and sharks, gathering coins and weapons. If you manage to get a weapon, the next time you run towards a shark you’ll hit it, clearing the way while gathering kills. Weapons do have a limited amount of charges. Using the coins you gather, you can unlock more weapons and upgrade the ones you own, giving you more charges on those. Weapons include a baseball bat, a golf club and the most expensive weapon: a broadsword. The games consists of rounds with each round containing 3 phases. The first phase is your basic avoid-stuff-and-collect-coins-while-smacking-sharks one. After a while, a surfboard will pop up which upon collection will take you to phase 2. 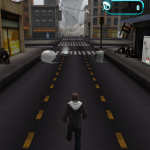 In that second phase, the streets of New York are suddenly flooded and you surf. The only thing you do here is try to avoid the sharks. If you manage to stay alive, you’ll get to pick up a chainsaw. 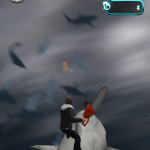 The chainsaw is what you’ll need in phase 3 in which you are actually in a Sharknado, standing on the back of a shark. You’ll get tons off stuff thrown at you but there’s always a shark as well and you have to aim to be flying at that shark of which the chainsaw will obviously take care. At first, the 3-phase system is fun and refreshing. However the problem in Sharknado: The Game is that every round exists of the exact same phases. The only big difference you’ll notice is the speed getting ramped up. Which leads to another direct problem: frame rate and performance. At times, the game struggles to keep up and feels poorly optimized. I’ve encountered several frustrating moments when sharks would just suddenly pop up out of nowhere with no time to avoid them, even when testing it on a device that should be well able to run the game smoothly. As with most free-to-play games, there’s an additional form of currency (Chum) which gives you additional benefits. 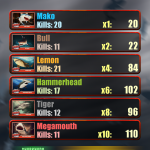 However in contrast to other games where it often feels like you’ll have to pay to win, in Sharknado it feels fair. Earning Chum is done by killing sharks, killing enough sharks of one species will level that species up and earn you one Chum. After a successful run, you can usually gather enough to allow you to start the next game at a later round directly or get some extra lives. During my playing I had more issues gathering enough coins to buy new weapons which felt slightly off-balanced with the amount of Chum I earned. You can also purchase extra coins and Chum through in-app purchases. 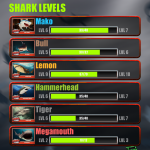 Sharknado: The Game takes on a successful gameplay-formula but fails at the execution. While certain elements of the game are great, like the fair micro-transaction system and the setting, other elements ruin that experience. A repeating round system and poor optimization are deal-breakers. I'm currently studying software-development. My main hobbies are gaming (software/hardware) and music (jazz saxophone player). I game primarily on PC (and also love building them) but also play on PS3, iOS and Android.